To shorten acquisition times and reduce file sizes most 2D spectra are typically acquired with far lower digital resolution than you would use for a 1D spectrum. This is often sufficient when only the 2D cross peak positions are of interest, but there are times when a more detailed analysis of a trace from a 2D spectrum, for example, requires closer analysis with better digitisation. 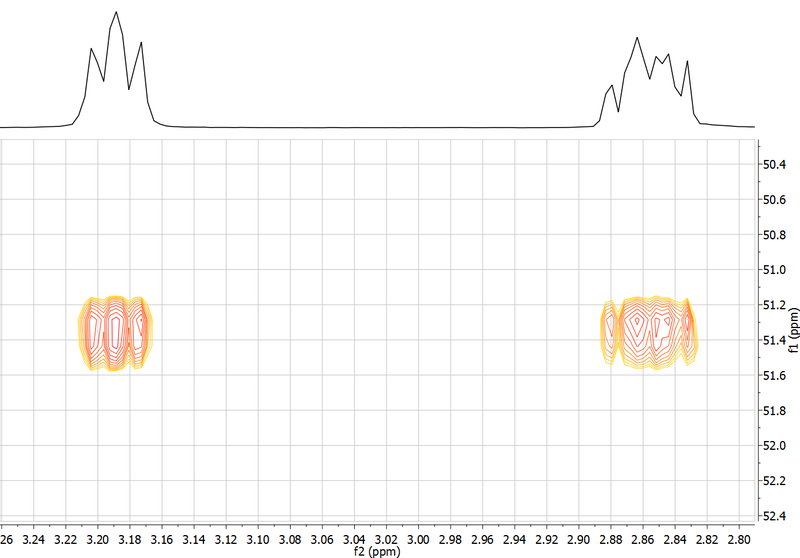 For example, traces from a 2D HSQC spectrum can be of interest with regards its accurate chemical shift and Js, which may not be directly measurable from the 1D 1H spectrum. The difficulty in manipulating a trace from a 2D spectrum is often that only the real data exist – but real and imaginary are required for further data manipulation. Mnova makes this process easy for you by quietly generating the imaginary component using a Hilbert transform. 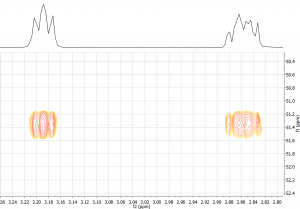 This is done seamlessly and automatically in Mnova, with the end result that you can extract a trace from a 2D spectrum and then reprocess it in any way you like: rephrase, zero-fill, linear predict, enhance resolution,… In the spectrum, below, is a 2D HSQC experiment of brucine in CDCl3. The data have 1K points in f2, and 256 in f1, and after processing the data matrix has 2Kx1K data points. Above the spectrum is shown the f2 trace for the expanded CHH’ signal. It would be nice to look at these multiplets with more detail. We see, below, that Mnova allows you to work directly with this extracted trace. 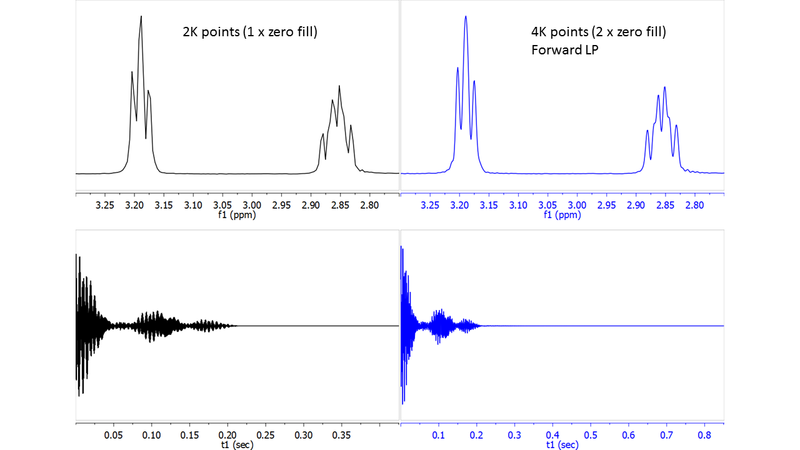 In black on the LHS is shown the FID trace for this multiplet (lower trace), and the corresponding sub-spectrum (upper trace). Note that you do not have to do anything special to do this reprocessing of a trace: Mnova automatically constructs the imaginary portion of the FID. There seems to be a small explosion of new technology to improve 2D qNMR and mixtures analysis. Here is a short list of articles and a poster that caught my eye recently. Power, J., Foroozandeh, M., Adams, R., Nilsson, M., Coombes, S., Phillips, A. R., and Morris, G. A. (2015). Increasing the Quantitative Bandwidth of NMR. Castañar Acedo, L. (2015). Development and application of modern pure shift NMR techniques and improved HSQC / HSQMBC experiments. Ph D thesis, Chemistry Dept, Universitat Autònoma de Barcelona (2015).